Watson received a 27-game suspension from NHL Commissioner Gary Bettman last month. The NHL and NHL Players' Association announced Thursday that arbitrator Shyam Das had reduced it to 18 games. The NHL issued a statement Friday saying that "we are disappointed with the arbitrator's decision." "We firmly believe that the right of appeal to an arbitrator of league discipline was never intended to substitute the arbitrator's judgment for that of the commissioner, particularly on matters of important league policy and the articulation of acceptable standards of conduct for individuals involved in the National Hockey League," the NHL said in its statement. The NHL added that "we will not hesitate to adhere to and enforce — through firm discipline as necessary — the standards of personal conduct we feel are appropriate for our league." The NHL doesn't have a written domestic violence policy and takes each situation on a case by case basis. The NHLPA also released a statement Friday, saying: "The NHLPA takes domestic violence seriously and continues to work together with the NHL to ensure that players are educated on this important societal issue. As part of those efforts, the NHL/NHLPA conduct domestic violence awareness training at our Rookie Orientation Program and during the season for all NHL players. "The CBA provides players with the right to appeal discipline imposed by the NHL for off-ice conduct to an impartial arbitrator. This essential right is intended to encourage the fair and consistent application of discipline. The arbitrator's independence helps ensure that the process and decision are fair. That is a principle to which we should always strive to adhere, even in cases where the subject matter is as difficult as domestic violence." 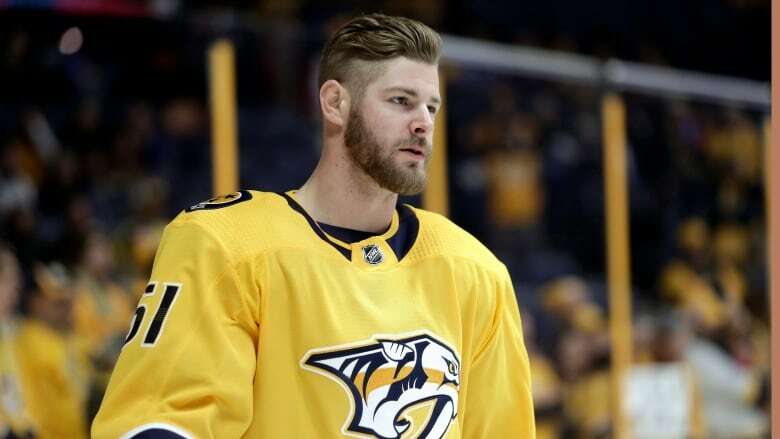 Watson was arrested June 16 after a witness flagged down a police officer to a gas station in Franklin, Tenn. Watson told police he and his girlfriend were arguing and that he pushed her. Officers said they found red marks on her chest, and she said Watson caused them. Watson pleaded no contest to domestic assault on July 24.